We have plenty ways for you to reach us! You may purchase through our website by adding the item you want to the shopping cart and proceed to checkout for payment when you&apos;re done. All successful order transactions will be receiving an order confirmation email within 30 minutes of purchase. If you did not receive any, kindly check your order summary in or proceed to your email . Account credit is the amount of RM will be stored in your account at our site which can be used to purchase items from us. As you purchase from our website, every RM 3 you spent will be entitled and received as RM 0.01 credits in your account! Also, as you return your purchases back to us, the amount paid will be transferred as credits which can be used on your next purchase! (We only refund in credit term. No cash refund(s) are allowed). All successful or confirmed order is not amendable. If payment made, we only offer refund in terms of credit note. Please ensure to make your payment within 1 day once you have made your order. All UNPAID Order(s) will be cancelled automatically after 1 day. We support free delivery for parcel(s) ships within Malaysia. We ship parcels during every working day once the order and payment have been successfully confirmed. For successful order confirmed before 1:00 P.M, the parcel(s) will be shipped on the same working day. Otherwise, it will be shipped on the next working day. Tracking numbers will be provided once our team have shipped your parcel. a. A notification email will be sent to you along with your order tracking number provided by us. We ship all parcel using Malaysia Pos Laju Delivery. Please allow up to 2 working days for the parcel to be trackable! Nutty provide returns/exchange for ALL item, except the following non-returnable items: Specifically stated non-returnable items, On sales item, accessories, swimwear, stocking, discounted item(s) using discount codes (unless specified returnable), Pre-order items (unless specified returnable), and free gifts by Nutty. We provide return/exchange within 12 days of the receipts. We have easy-return-policy with 3-easy return steps only! ou are welcomed to return us your purchased item, the amount paid will be transferred as RETURN CREDITS in your registered account that can be used on your next purchase! (We only refund in credit term. No cash refund(s) are allowed). 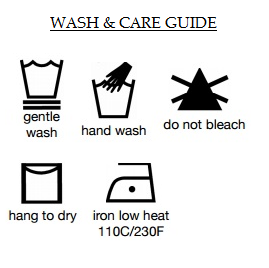 Below is the laundry guide to take care of your apparels purchased from us.